I used beautiful papers from Maja Design and very cute Dressed for festivity Tilda stamp. I coloured the image with distress inks. I made the flowers myself - I used RosyDot #3 and Whimsy Lily flower dies. I used ecru and olive green foamiran, and yellow glitter stamens, double headed white stamens and ecru micro bead stamens. All of these products are available in Magnolia-licious store. At the end I also embellished the card with some lace, pearls and crystals. That's it from me today. Have a wonderful day! Wow, this is so pretty! Love the soft colours and all the details. It's my birthday too later this month. What a beautiful card to receive. 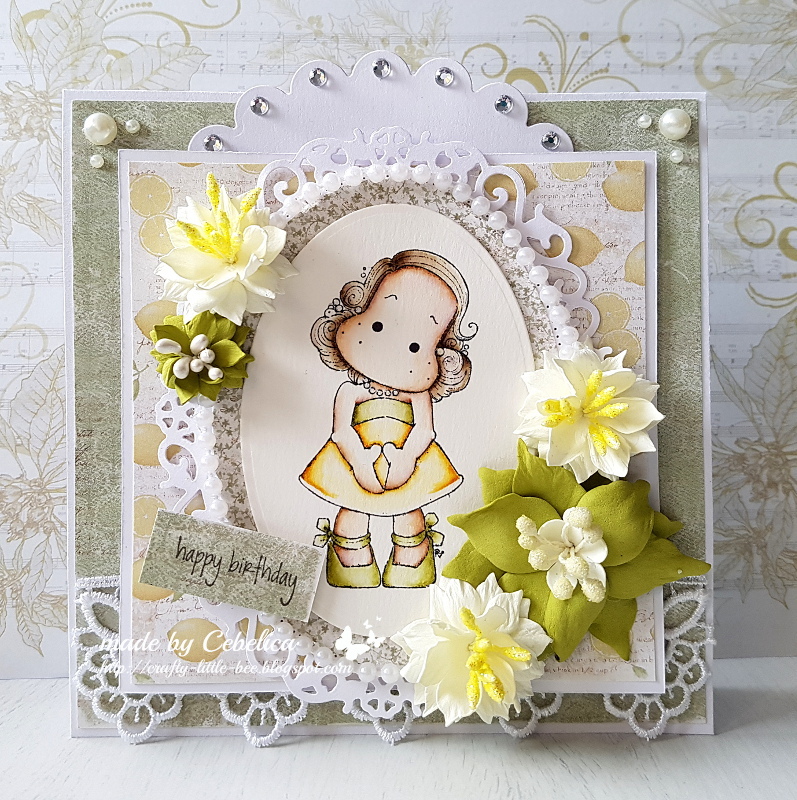 Such a pretty creation in soft Spring colours for our 'Flowers' theme at Stamping Sensations many thanks for joining in. This card is just stunning!! Your Mom will love it for sure! Thanks for joining us over at One Crazy Stamper! aaaaw, what a beautiful make! I love the yellowish-greenish touch and the sweet image! Thank you for showing your card at Ally's Angels, so happy that you are part of my journey! Prekrasna. Mi zelo paše na polico. This is so pretty. Love the lemon and green cilihr combination and Tilda is so sweet.